The Global Twins & Multiples PSP survey has been launched in conjunction with Twins Research Australia, TAMBA and St George’s hospital. In this world-first initiative, we are giving twins and multiples the opportunity to steer future twin and multiple-birth health research in the direction that matters to you. Help us to identify the top research priorities for twins and their families to enjoy optimal health and wellbeing. We believe there is insufficient attention given to the specific health needs of multiple-birth families even though the number of multiple births has increased over time. It is important that decisions about future research priorities don’t rest with researchers or government funding bodies alone. 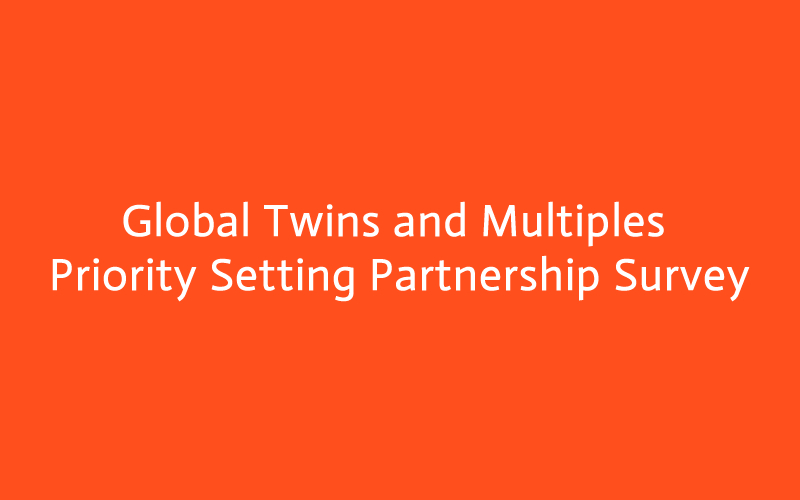 Our partnership wishes to hear the voices of all stakeholders in multiple-birth care – twins, higher-order multiples, their parents and families, GPs, obstetricians, paediatricians, midwives, maternal health nurses and educators. Ensure your voice is heard by filling out an initial 15-minute online survey. You’ll be asked to nominate up to three important unanswered research questions on the health of multiples relating to issues such as pregnancy, birth, parenting, childhood development, diseases, emotional and mental wellbeing etc. You can complete the survey or find out more information by clicking on this link. To watch a video about the survey click here. The survey closes 5 November 2018. We would also appreciate if you could share this survey with others in your circle e.g. twin friends and families, multiple-birth clubs, your GP and specialists. It is open to everyone who supports twin lives and wellbeing.